Whenever your hosting guests during the holiday season or having friends over for a dinner party an easy way to serve your guests an appetizer is to dazzle them with a Cheese Platter. 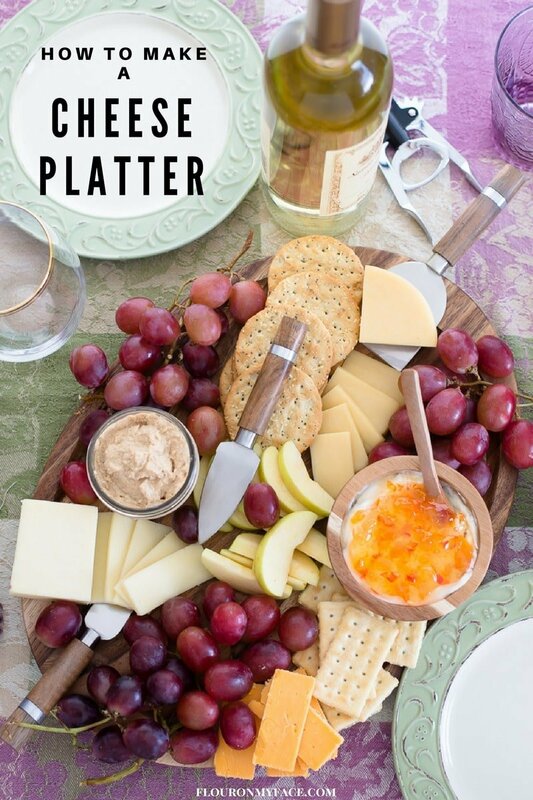 Entertaining is so easy when you learn how to make a cheese platter. Disclosure: Some of the links in this post are affiliate links for Flour On My Face personalized product recommendations. You can check out my Amazon Influenecer page for more products I use and love. The holidays are the perfect time to serve a cheese platter. More than likely you already serve some sort of cheese platter or cheese plate when you are entertaining guests. Maybe friends stop by unexpectedly and you need an easy appetizer to serve. You pile some sliced cheese and crackers on a plate and everyone digs in. We serve a cheese platter or cheese plate at every single birthday party or holiday event we host with family and friends. Our cheese platters usually consist of a plain old divided plastic food serving tray piled high with slices of cheddar cheese, pepperoni slices, pickles, and olives. During the holiday season we all love to decorate when we entertain guests so everything looks pretty. Why not turn a very easy holiday appetizer plate into something special? I think the holiday season gives us the perfect excuse to serve up a fancier cheese platter or cheese board while we celebrate the holidays with family and friends. To take your everyday cheese platter and turn it into something special get yourself a wooden cheese board. Wooden cheese boards are available in all shapes and sizes. If you really want to impress your guests buy a spectacular cheese board set like this Bamboo Cheese Board with Cutlery Set, Wood Charcuterie Platter and Serving Meat Board with Slide-Out Drawer with 4 Stainless Steel Knife and Server Set. Then you’ll be ready to serve a simple cheese platter or go all out when entertaining. You’ll have everything on hand no matter what type of cheese platter you plan to serve. If you already have a cheese platter on hand but you need some cheese knives to make cutting and serving the cheese you can buy an simple set of cheese knives. This 6-Piece Cheese Knife Set has a cheese knife, cheese fork and cheese spreader to cut and serve any type of cheese you may be serving. What are the best cheeses for a Cheese Platter? You decided to serve a cheese platter but your not sure what the best cheeses are for your platter? Simple cheeses are a best bet when your not sure how your guests tastes run. Next time your out shopping take a look through the imported cheese case. There are many varieties of cheddar cheese available. You could make a cheddar cheese only cheese platter and still serve a variety of cheddar cheeses. Soft or hard cheeses on your cheese platter? It is a good idea to offer a soft cheese spread along with the hard or semi hard cheeses. A simple soft cheese spread is cream cheese. Softened cream cheese can be dressed up with a hot pepper jelly. If you are into canning you could make one of my homemade pepper jellies and pour it over a block of softened cream cheese and serve it on your cheese platter. I used my Habanero Apricot Jelly in this photo. It is my new favorite pepper jelly! A simple Cheese and Cracker platter will serve most purposes. Pick a few of your favorite hard cheeses, one or two types of crackers and almost everyone will dig in heartily. If you want to get a little fancier serve a Fruit and Cheese Platter. You can go even farther and pick a theme for your fruit and cheese platter. During the fall serve crisp apple slices, fresh figs and pear slices with a few delicate types of cheese. Smoked Gouda cheese tastes wonderful with in season fall fruits. If you need a hearty party appetizer to serve a manly crowd a Cheese and Meat Platter would be perfect. 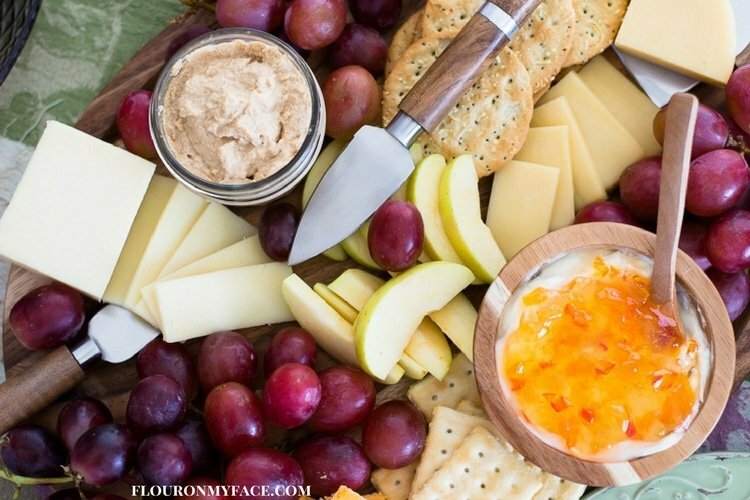 Fill your cheese board with sliced pepperoni, sliced or cubed salami and cubed sausage along with cheddar cheese, Swiss cheese and provolone cheese and this easy appetizer board will satisfy the hungriest of your guests until the main course is served. Wooden Cheese Platter or Cheese board to serve the cheese and crackers to your guests. If you don’t like the look of a wooden cheese board you can buy a large slate cheese board with a set of cheese knives that you can write the names of the cheeses you are serving on it with a piece of chalk. 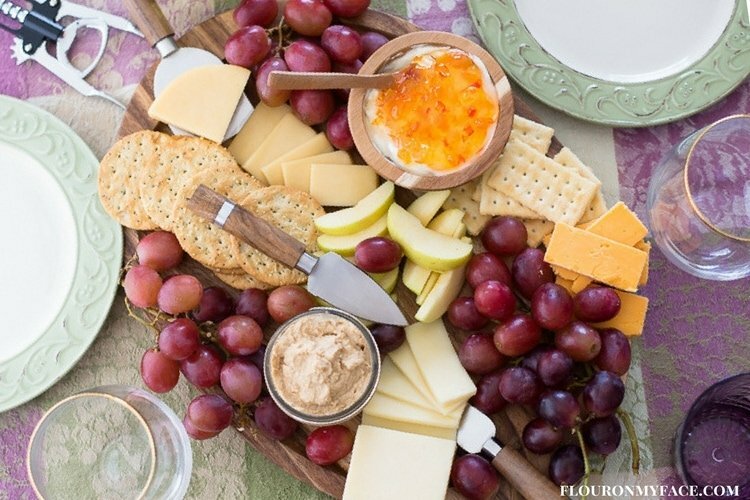 Marble cheese boards are also very pretty and can be the focal point of your appetizer table. Cheese Knives to cut the blocks of cheese. Apple-wood Smoked Gouda Cheese, cut into slices. Sharp White Cheddar Cheese, cut into slices. Golden Delicious Apples, sliced. Golden Delicious apples do not brown as quickly once cut as most other apple varieties do. Homemade Dijon Mustard or other spicy mustard to spread on the cheese. Homemade Apricot Habanero Jelly or Hot Pepper Jelly to serve over a softened block of cream cheese. Softened Cream Cheese to serve with the hot pepper jelly. Carr’s Cheesemelts Cheese Crackers for a fun twist on crackers and cheese. Ritz Crackers or Club Crackers. I love serving buttery club crackers with sliced cheese. The slices of cheese when cut from a square block fit perfectly on a Club Cracker. How to make a cheese platter to serve your holiday guests and easy appetizer. Wooden Cheese Platter or Cheese board to serve your guests. If you don’t like the look of wood you can get a large slate cheese board with a set of cheese knives that you can write the names of the cheeses you are serving on it with a piece of chalk. Arrange a variety of sliced cheese and crackers on a cheese board. Place a bowl of softened cream cheese and hot pepper jelly on one end of the cheese board. Place a bowl of homemade Dijon Mustard or other spicy mustard on the other end of the cheese board. Tuck bunches of grapes in between the cheese and crackers. Add some fresh apple slices. Place cheese knives on the cheese board. Want to create the perfect cheese platter? Check out these books on creating the perfect cheese plate. The Art of the Cheese Plate: Pairings, Recipes, Style, Attitude: This book succeeds by matching some of the world’s greatest cheeses with unexpected, seasonally inspired flavors and textures and presents a composed cheese plate as a fun, modern, and accessible option for delicious entertaining. Composing the Cheese Plate: Recipes, Pairings, and Platings for the Inventive Cheese Course: Cheese need not stand alone! Composing the Cheese Plate isn’t just another cheese book — it’s a gateway into the wonderful world of pairing and plating your favorite cheeses with dozens of sweet and savory condiments. Tasting Wine and Cheese: An Insider’s Guide to Mastering the Principles of Pairing: Is there anything better than a great wine and cheese pairing? For some, it can be challenging. The good news? Creating a combination that makes your mouth sing is easier than you might think! Mastering Cheese: Lessons for Connoisseurship from a Maître Fromager: Maître fromager Max McCalman, author of The Cheese Plate and Cheese, is steeped in the world of artisanal cheeses like no one else. In Mastering Cheese, he shares the wealth of his expertise to help cheese lovers on their path to connoisseurship. One of my great pleasures in life is a delicious cheese platter, and I think you’ve nailed the key points of creating one. Well done! Thanks! No holiday needed to enjoy a cheese platter!